On March 22, 2018, Dr. Rainer Kuschnig, Operations Manager of BRITE-Constellation at Graz University of Technology in Austria, was very surprised at his daily verification of the five nano-satellites. In one of the BRITE sub-images a second star suddenly appeared, which had not been there the day before, and which became brighter thereafter day by day. “Over the last five years, I’ve seen millions of images taken by our satellites, but I’ve never seen anything like this!” said Dr. Kuschnig. He immediately informed the BRITE Science Team including Professors Anthony Moffat and Nicole St-Louis, both at Université de Montréal and members of the Center for Research in Astrophysics of Quebec (CRAQ). A search on the web led to an independent announcement by the “All Sky Automated Survey for Supernovae (ASASSN)” that the new star was identified as a nova and named “ASASSN-18fv” or more elegantly “Nova Carinae 2018”. Figure 1. BRITE images (a) taken on March 1, 2018 with only the red giant HD 92063 and (b) taken on April 14, 2018 with both HD 92063 and Nova Carinae 2018 (ASASSN-18fv). BRITE-Constellation conducted regular observations in the constellation of Carina. 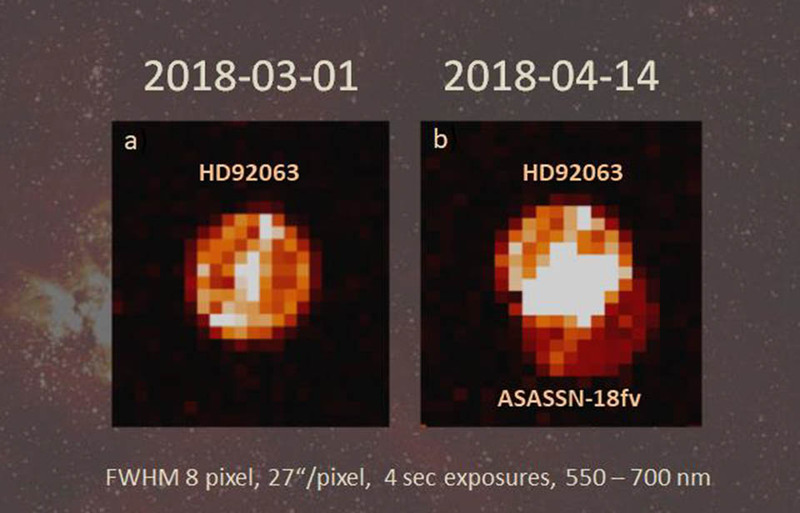 This time, which began in February 2018, one of the 18 bright stars in this field, the red giant star HD 92063, appeared to show large, unusual brightness changes (see Figure 1, left). At an angular separation of only two arc-minutes (for comparison the Moon is 30 arcminutes across) from the red-giant star, a nova had unexpectedly turned up on the detector, a month after the observing session in Carina had started. 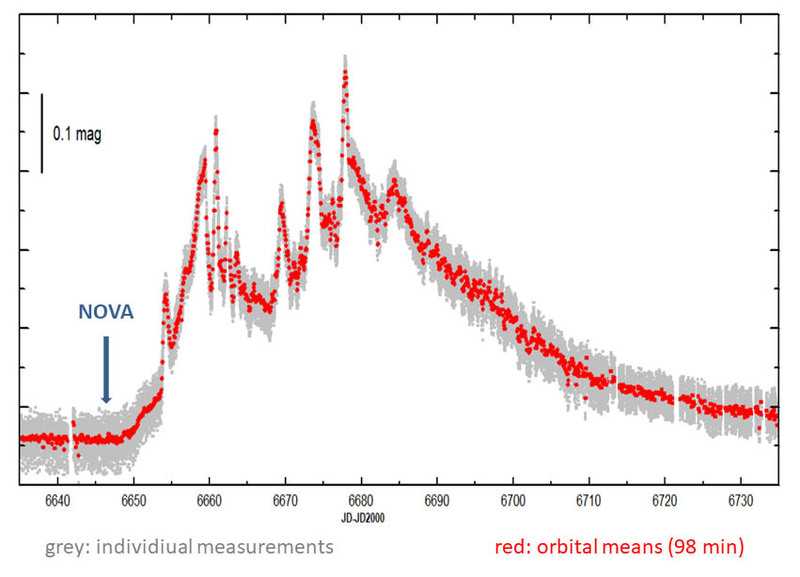 The nova rapidly increased in brightness (see Figure 1, right). A nova, or more correctly a classical nova, is a transient astronomical phenomenon where unexpectedly and suddenly, a bright, seemingly new star appears in the sky. The phenomenon first gains in brightness, and then slowly fades over several weeks to months. 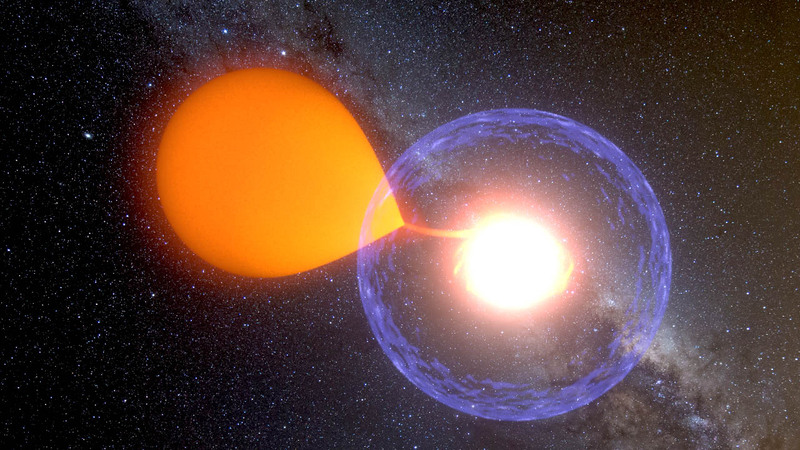 The precursors of all observed novae are always binary systems with two very close stars in mutual orbit around each other. This leads to a flow of matter from one star to the other (Figure 2). In the case of a classical nova like Nova Carinae 2018 this involves a very compact white-dwarf star which accretes matter from its normal companion star. Once enough matter is accreted, there ensues a nuclear explosion on the surface of the white dwarf, which becomes much brighter than the two precursor stars. Figure 2. Artistic representation of the outburst of a nova (Copyright: K. Ulaczyk, Warsaw University Observatory). Normally novae are discovered by specially designed instruments with ground-based telescope and observed only a few times per night. Only when several stations report the discovery will the observations start to be taken over by more sensitive instruments on Earth and in space. Until that happens, though, two to three weeks will have gone by after the outbreak of the nova. This means that the first, volatile phases of the Nova are often observed with insufficient frequency and accuracy. But it is precisely these early stages that are particularly important for understanding the nova phenomenon. In the case of the Nova Carinae 2018, however, the BRITE-Constellation satellites observed the complete development of the nova: the original outbreak, the brightness maximum, and the final phases – all in unprecedented temporal resolution and precision over a total of 150 days (see Figure 3). This provides a unique opportunity for experts in this field of research to study the crucial initial stages of a nova outburst and thus provide a solid theoretical basis for their understanding. Figure 3. BRITE-Constellation brightness measurements of Nova Carinae 2018 (ASASSN-18fv). BRITE-Constellation (http://www.brite-constellation.at) is a fleet of five functioning nano-satellites that capture the light of the brightest stars in the sky with high precision. BRITE is a concept first conceived and built in Canada, which is one of three countries that contribute satellites to the constellation. Austria launched the first two satellites (Uni-BRITE and BRITE-Austria = TUGSAT-1) on 25 February 2013 as the first-ever satellites of that country in a near-earth orbit of about 800 km altitude. Four other identical satellites were then launched into similar but distinct orbits by Canada (BRITE-Toronto and BRITE-Montreal, the latter unfortunately not reaching its proper orbit) and Poland (BRITE-Lem and BRITE Heveliusz) by mid-2014. BRITE-Constellation has since observed more than 550 stars ranging from 0 to 6th apparent visual magnitude, with the faintest stars visible to the naked eye from the ground under excellent viewing conditions. In each 24 square degree field, an area as large as the entire constellation of Orion, typically 15 to 20 stars are measured continuously for about half a year.